Well, it's been a while since I posted my first free tutorial, and I thought now would be a good time to post another. 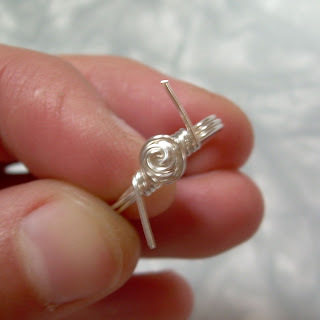 This super-simple ring is the perfect starting point for learning to make all kinds of more elaborate wire wrapped rings. After you've perfected this one, start experimenting with variations - different metals, adding beads and stones, etc. - and show me what you come up with! 1. 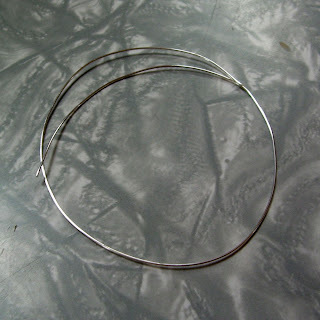 Cut a 12" length of wire from your spool. 2. 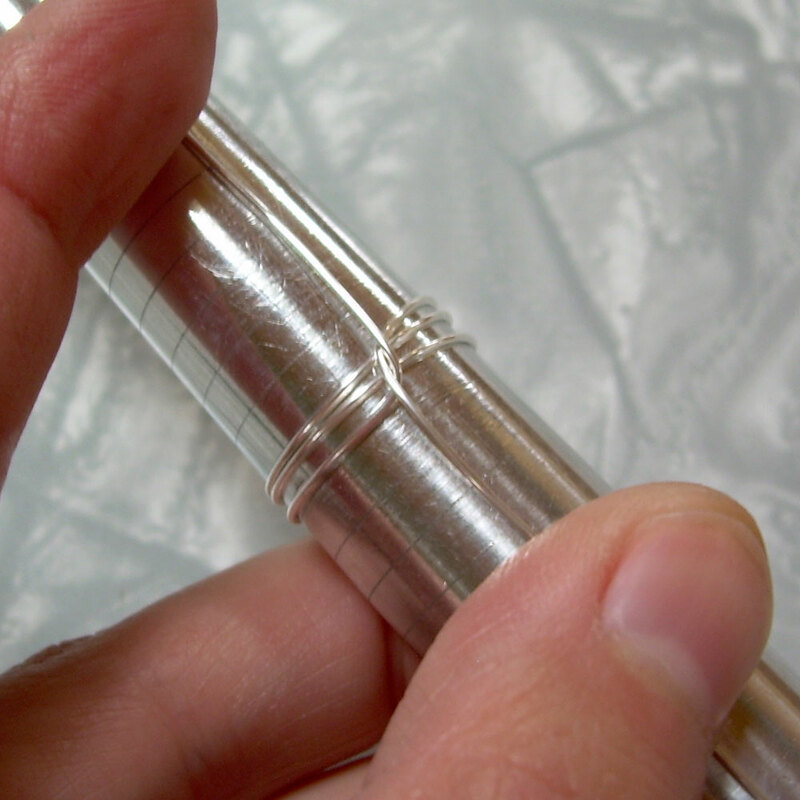 Position the wire on your ring mandrel at about 1/2 to 3/4 of a size larger than what you would like your finished ring to be. 3. Wrap the wire around the mandrel three times, ending with roughly equal lengths of wire sticking out to either side. 4. Cross the wires, keeping tension on the wire to keep all three loops tight against the mandrel. 5. Begin to wrap the wires in a circular direction. Don't twist them; just guide them around the center of the rosette in a circular manner. 6. 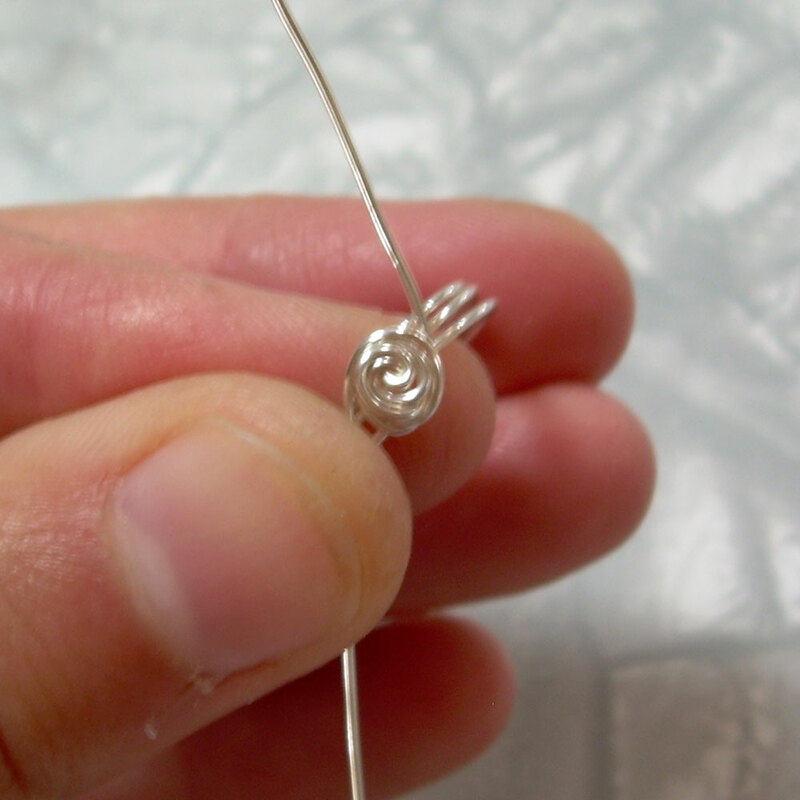 Continue wrapping until you are happy with the look of the rosette, or until you have 1 to 1-1/2 inches of wire left on each end. 7. 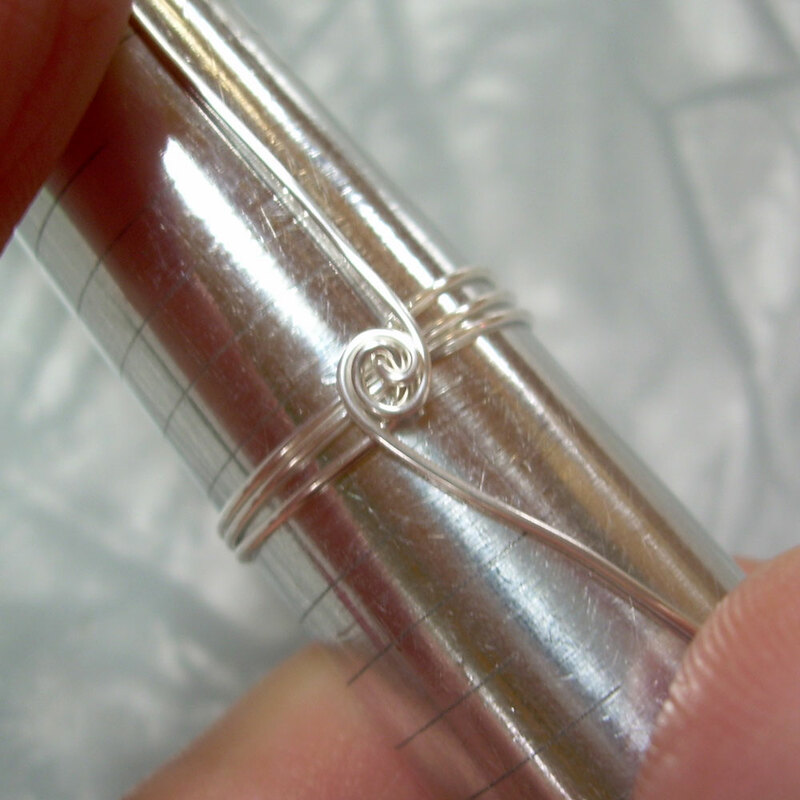 Wrap each wire around the ring shank several times. 8. 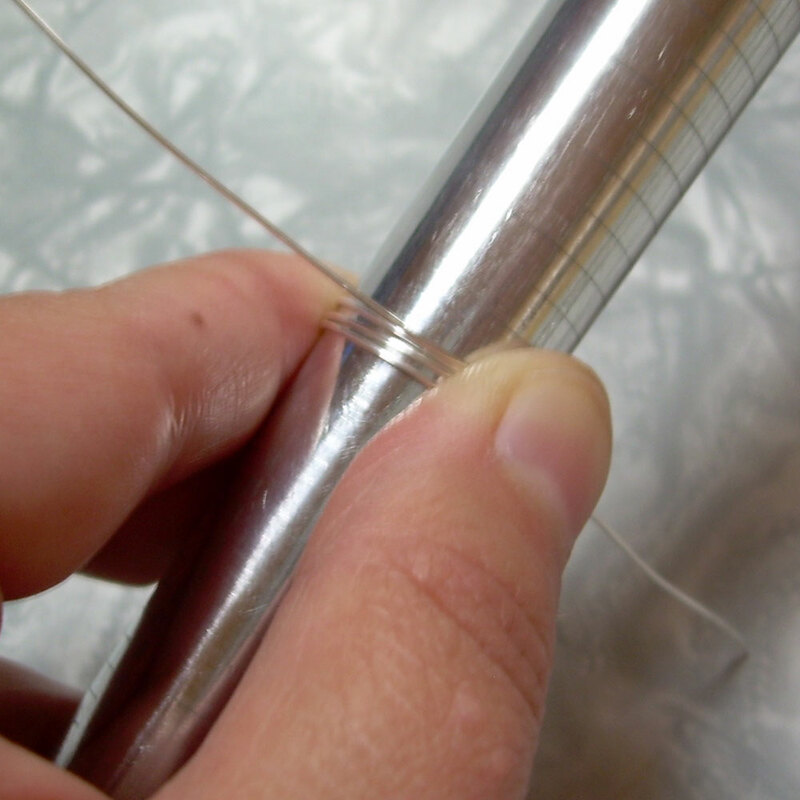 Trim the ends of the wire close to the ring band. 9. 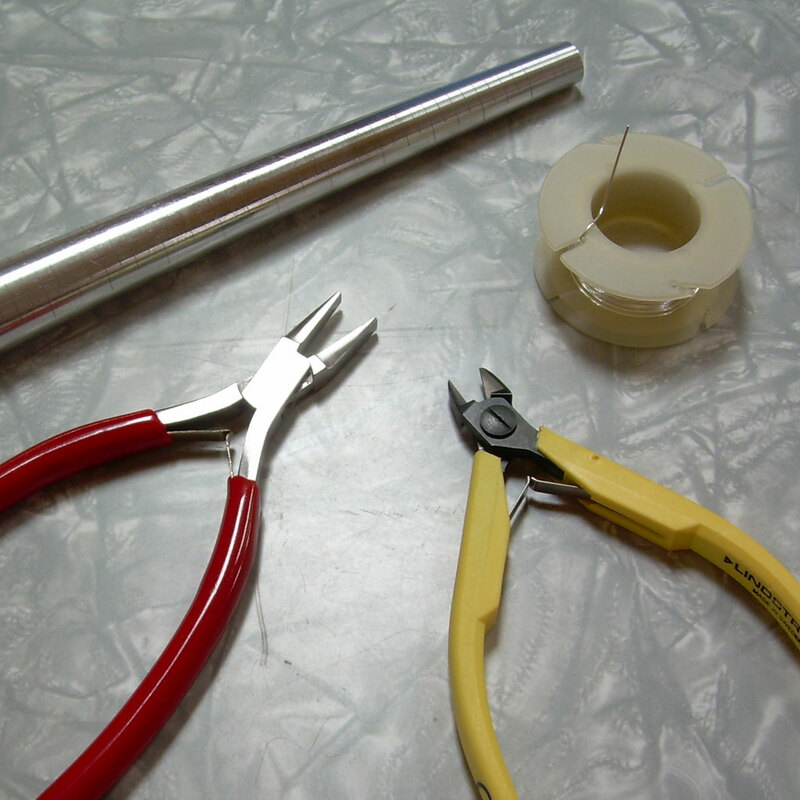 Using your flat-nosed pliers, gently press the ends down flat against the band. 10. Slide the finished ring back down onto the ring mandrel as far as it will go to make sure it is as round as possible, and to help even out the three wires that make up the band in case they got a little uneven during the process. You can either leave the ring shiny, or oxidize and polish it to bring out the details. I hope you enjoyed this tutorial; please let me know if anything is unclear and I'll do my best to clarify! Tamara - thanks so much! I made my first earwires using the tutorial you posted earlier, it's just so generous of you to share these things with those of us who haven't tried them yet. Cool!! I've never made a ring but have always wanted to. I just might have to go try this!! Thank you so much!! Thanks a lot for sharing this tutorial with us. I now have to go get some wire to try this ring and also the ear wires you made on your first tutorial. Can't wait! oh wow! Thanks for posting this, Tamara! I received my Sampler yesterday, and your wire wrapped ring with swarovski simulated pearl was my favorite thing in there! Thanks! Thanks for sharing this, I totally want to try this! Do you have any idea how much one of those ring mandrels cost? This is a really great tutorial. Thanks for taking the time to show us how you do it. 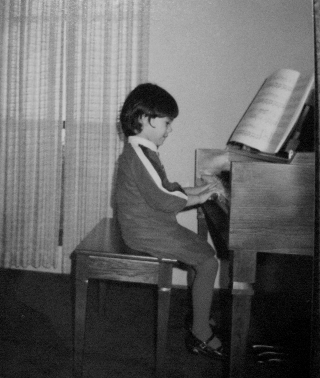 It's inspiring to see how you did it. Sara, I'm not sure, but I would think around $20 for a ring mandrel? 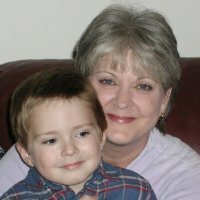 Try jewelrysupply.com, firemountaingems.com, riogrande.com, or artbeads.com. Very Very cool! Thank you for posting and with pictures as well! Beautiful Ring also! Great job! Great tutorial! I will have to try this one. Thanks. hello! 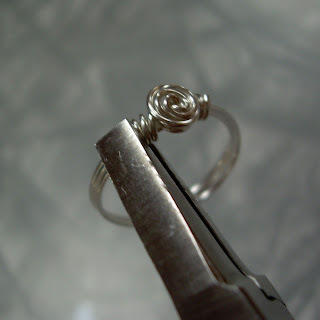 i just tried making your amazing rosette ring. It's turned out beautiful. Thank you!! it's so helpful with pictures too.. Okay, I just tried to make this and mine came out so sad. It was just a practice one, I don't have a ring mandrel so I used the same sharpie as in the ear wires and I can't even get the ring over my pinkie nail! 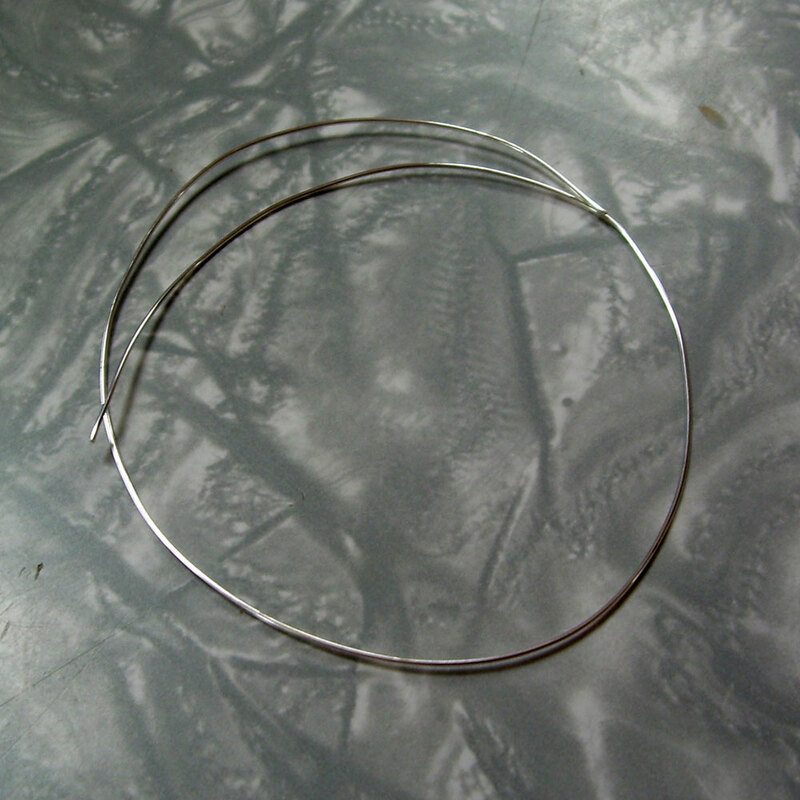 I had a hard time wraping the wire around the band so I have to keep practicing. However the middle does look like a rose. Any tips on wrapping around the band? Great idea! Thanks for shareing. Thank you for sharing this with us! I have been posting jewelry listings on Etsy since November, but I haven't made any rings yet. I would love to try this! Thank you so much for the tutorial. I have been trying to find a wire wrapping tutorial for making rings for ages that i didnt have to pay for. myself and my fellow members tip our hats to you for spreading knowlege out of your own charity. Hi Lisa! 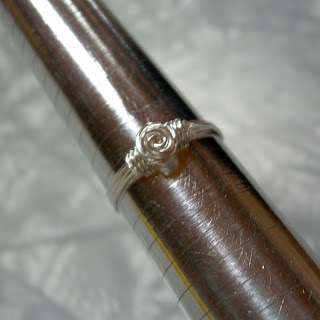 Just found you today thru Jean's blog - I made the ring, my first, and it is so cute!!! I'm a big girl and this tiny little ring is kinda lost on me, but I'm wearing it anyway :) and will make another one with maybe 20ga wire. Excellent tute - thank you! Thank you for the generous tutorial! I've been trying to make rings from some shanked vintage buttons, and your method will help me make them look a lot neater. I'm late seeing this but I still wanted to say thank you for posting this ....very fun. I made my first out of copper and after I have it down perfect I'll try silver! great tutorial, thank you for sharing it! Thanks for sharing this tutorial. I love the ring and I immediately went and made three with copper wire. The first was plain wire and the next two I added a small bead to the center for a really nice accent! That is so pretty and simple. Thanks for the tutorial. Wasn't sure about the size, as not sure about my ring size so I ended up with a rather large ring, but it fits my big toe fantastically!!! When I found this design, I thought it looked good and easy enough for me to attempt it. I wasn't disappointed. I made seven for some girls I know, and they loved them. 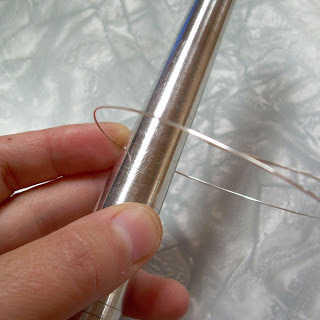 $25 got me 10 ft. of silver wire, and I didn't want to spend another $25 for a ring mandrel, so I looked around my house for some other things I could use. For about a size 6 ring, I used a Mini Mag flashlight. For about a size 4.5 ring, I used a AA battery. Thanks for the instructions, and for scoring me some big V'day points. I made this when I saw the instructions. It is absolutely adorable! What could be easier? THANK YOU! Made and it is adorable! Thank you so much! I really like this. Thank you so much for the info! Tamara...thank you so much for sharing this...wonderful tut!! I'm ready to go shopping for some silver wire and get busy..LOL!! 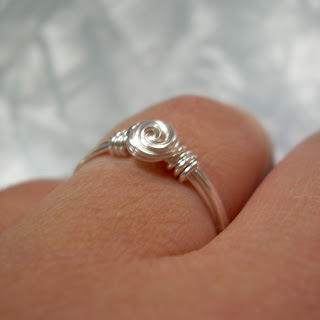 I have several nieces that would love some handmade rings. Thank you! This tutorial is easy and so much fun! I just made the ring and it is gorgeous! Thank you! This tutorial was so easy and so much fun! I just made the ring and it is gorgeous! Please put up more easy, fun tutorials. Thank you so much for this tutorial! I am hooked! I made four rings today, one out of copper 20ga and three out of silver 20ga. It's not dead soft so my fingers are sore..lol. One was a button ring. They all turned out very nice considering I don't have the proper tools yet. Once again...Thanks! This is an awesome tutorial, however some of the pictures are not displaying on the website. Is there anything you can do about this. I am a visual learner, especially when it comes to crafts. I would appreciate it. thanks. 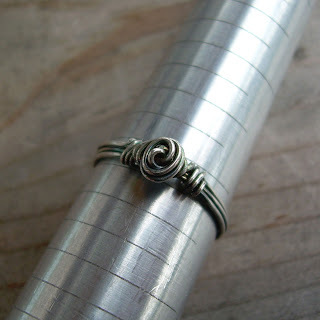 I was searching for wire wrapping rings and this tutorial came up… After reading the steps, I thought I would give it a try. Five minutes later I made my first wire wrapped ring thanks to you and your excellent step-by-step tutorial. Great tutorial great picture. You can use items fund around the house if you don't want to buy the ring mandrel. Try nail polish or a mascara tube. Hi there, I am jut starting to make these and I took a class at a local bead shop. We used the 20 gauge artistic wire for class purposes but I would like to make a silver one. I never know which type of wire to use when. I see that you used dead soft on this but half hard on the ear wires, also, how does the wire that you used for the ring compare to the artistic wire, is that considered half hard or dead soft?? Thanks!! crlacy - you could use either dead soft or half hard - dead soft is going to be easier to manipulate into shape, but also more easily bent out of shape as a finished ring, which you don't necessarily want (though if that were to happen you could probably re-shape it again on a mandrel quite easily). Ideally, I'd use dead soft for ease of use during fabrication, then put it in a tumbler with some steel shot for about an hour to work harden the metal. I am just now starting to make wire wrapped jewelry. I saw this post on pinterest. The instructions were simple and very helpful, thank you. thank you for sharing. i have just started to do wraped wire. it is very interesting some of the creations are very beautifull. Register to win a $25 gift certificate here! Chocolate and Jewelry, What Could be Better? July Jewelry for Charity Recap & August Kick-Off!